You prompted me to write this limerick. Hope you like it. This old man was blessed and soul worth saving. Hmmm…sounds like that orchestra was a bit more than frustrated, huh? Love that cartoon, Rob! Umm … I lived through this limerick a thousand times from the ages of 10 to 15. Good grief how I hated orchestra. But I’m sure they hated me more. that’s SA A A A A D ! Yes. I’m firm now. Brutally funny. 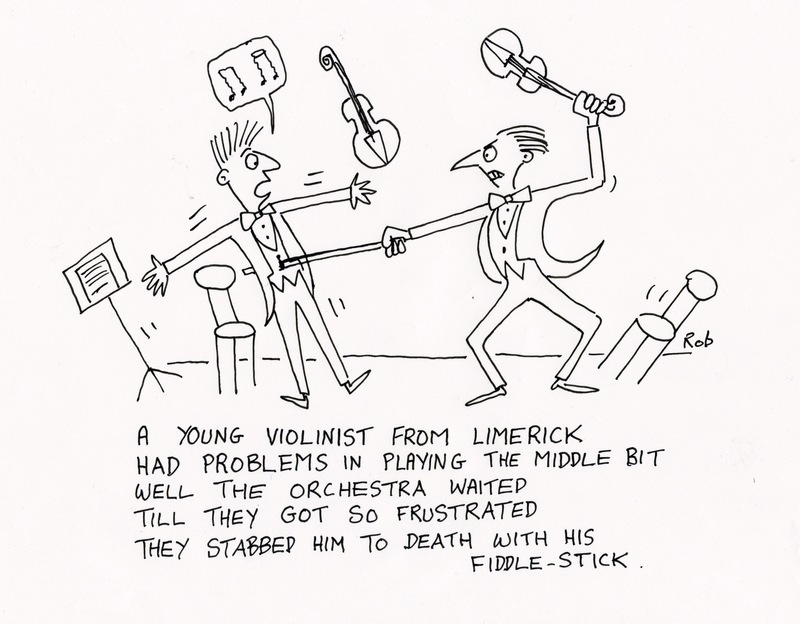 My mom used to say ‘fiddlesticks’ when she was frustrated. Your limerick unearthed that memory for me tonight. Well I do hope the unearthing of the memory was a pleasant experience. My grandmother used to say “fiddlesticks” too. It’s a lovely word which seems to have gathered dust over the years. There you go! I love “thingummyjig” too. It’s such an all-encompassing word/phrase. You are hysterical. I love limericks and all of yours are a stitch. Thanks for making me smile.